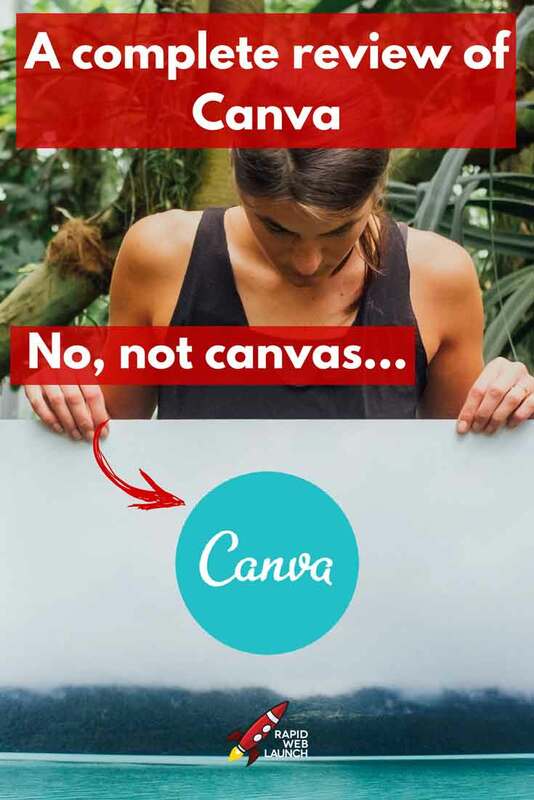 I know this because, if you were, you wouldn’t be looking up Canva reviews in your search for an affordable, easy-to-use online graphic design tool. It’s just a natural fit. When I first started blogging to market my web design business, I was conducting the exact same search. I needed a graphic design tool that was free, simple, and so easy to use. I didn’t have time to learn graphic design skills from scratch. And that’s when I came across Canva. Why do you need a graphic design tool? Because, in short, the internet runs on imagery. More than ever before. People don’t have time to read your 3,000 word blog post. They will, however, skim through your post and pause at all of the unique and custom imagery you’ve created. That is, if it’s any good. In this day and age, it’s crucial to get your brand’s message across through images and video. For that reason, you’re going to need a good graphic design tool to design your own custom images. And, if you’re a complete noob like I was, you want that graphic design tool to be super easy to use. So let’s dive in to this full review of Canva and see if it makes sense for you, shall we? Canva is loaded with awesome features. The basics are all covered, as well as some more advanced stuff. But by far the coolest thing about Canva is the sheer number of custom templates they have on display. Blogging, ebooks, social media, YouTube, marketing documents, graphs, desktop wallpapers… it’s all here. But Canva’s real strength is how easy it is to use. It utilizes a drag-and-drop interface, much in the same way that Weebly does. No coding. No pencils, paint, or brushes. Canva also uses a unique wireframe system that automatically “snaps” your images, icons and text into the proper place. This makes it absurdly easy to align your graphics any way you like. Your clients will think you’re a professional graphic designer. It’s honestly hard to convey just how simple it is. That’s why I encourage you to sign up for the free account and try it yourself! When I first signed up with Canva, I went with the free version. After using Canva for a few months, it became clear to me that this was a product worth paying for. In fact, at $13/month, I think it’s a straight up bargain. It is a small investment to make in what is such a crucial part of building an effective brand. You can see above the extensive list of features that are only available with the premium version. Another option is to go with the free account, and just pay for premium images as you need them. They go for about $1 each. So, if you’re someone who only needs to create a handful of images a month, this could be a better option for you. But, in case you find yourself in need of some help, they have built a massive library of content to hold your hand along the way. Blog posts, videos, tutorials and even full online courses are all at your disposal. Completely free. That said, if you find all of that overwhelming, and need to talk to a human being, it is very difficult to find some contact info. Unfortunately, this is a very common practice with online businesses these days. Who’s got time to talk? If you’re in need of a free graphic design tool that is easy to use and won’t take you months to master, then I can’t recommend Canva enough. I know what you might be thinking. The answer is no, I’m not getting paid for this review. Though I probably should be, right Canva? ? I just love their product so much that I believe more online business owners and bloggers should know about it. And you know what? It’s completely free. So why not try it out for yourself and let me know what you think? Yes, Canva has a free version of their platform that will cover the basic needs of nearly everyone. They also offer a “premium” version called Canva for Work as a monthly subscription. How much does Canva for Work cost? Canva for Work, Canva’s premium online-based graphic design software, is $9.95/month USD when paid annually. If paid monthly, it’s $12.95/month. What is Canva used for? Canva is an easy-to-use graphic design tool that can be used to create images, documents, graphics and files of all kinds. From business cards, logos, flyers and pamphlets to YouTube thumbnails, Instagram Stories and Facebook Ads, Canva can help you design them all.